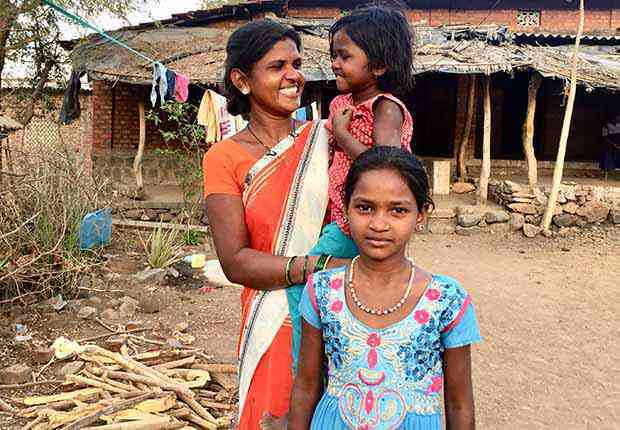 The 29-year-old is an ASHA (accredited social health activist – a community health worker under the National Rural Health Mission) in Velgaon, a village in Palghar tehsil, Thane district, 95 km from Mumbai, India’s financial capital. Ozre is used to spending four to five hours a day at work, away from home, but this can go to up to 24 hours when there is a baby on the way. In addition, she must wake up at daybreak to fetch water for her family, cook and clean for them, and work as a hired farm-hand during planting and harvest seasons. Indian women like Ozre do the most unpaid care and domestic work of any country globally, except Kazakhstan – a country with 94% lower gross domestic product than India ($163 billion versus India’s $2.6 trillion). 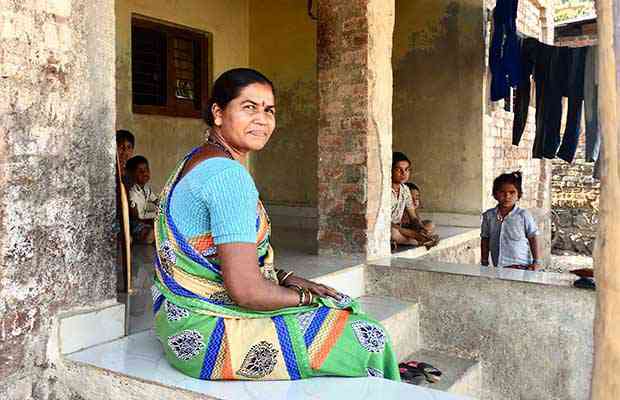 It reveals that India is not investing enough in social care and “leaving its female population to carry the burden”, said Diya Dutta, a researcher at Oxfam India and author of a forthcoming Oxfam report, Mind the Gap, to be released on March 28, 2019. 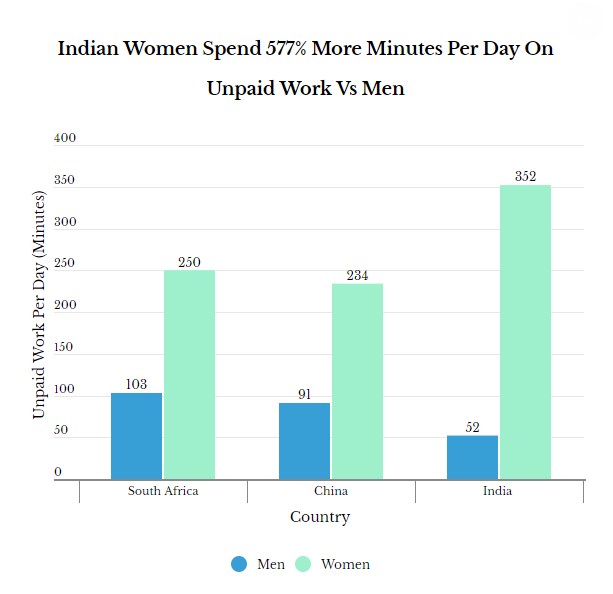 Women in India currently spend upto 352 minutes per day on domestic work, 577% more than men (52 minutes) and at least 40% more than women in South Africa and China (the other two BRICS countries for which data are available), according to Organisation for Economic Co-operation and Development data. India’s last “Time Use Survey” was conducted in 1998-’99, and there has been no similar exercise since. Fixing this will be the first step in understanding the issue of women’s unpaid work and correctly addressing it, said Jayati Ghosh, professor of economics at the Centre for Economic Studies and Planning at the Jawaharlal Nehru University in Delhi. 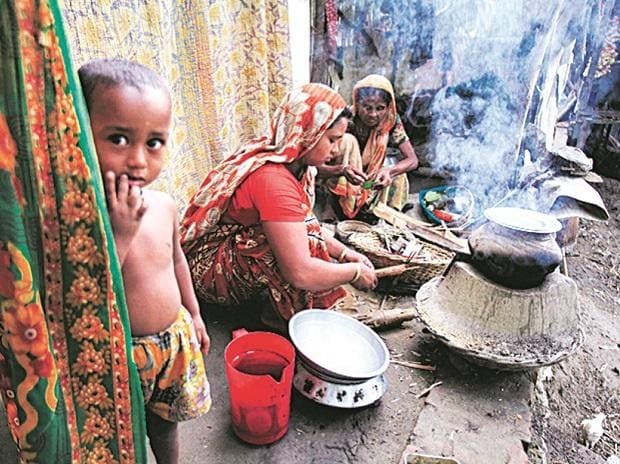 The National Sample Survey Office survey is inadequate because it does not take into account women’s double burden of cooking, cleaning and other domestic duties, Ghosh said. “It just asks about your ‘principal activity,” she added. Women in low-income households are also more driven to find paid work than women in higher income households where not working can be a marker of social status, as per the report. Combining paid work commitments with a mountain of menial, domestic labour at home means poor women are more likely to suffer from ‘time poverty’. This is understood as experiencing such acute time pressure – anxiety that there is little freedom to choose how to allocate one’s time, with little or no room for leisure. Time poverty fundamentally undermines women’s human rights since it undermines women’s agency and ability to make choices, as per the Oxfam report. The immense burden of work therefore prevents women from pursuing further education, employment opportunities, raising their skill-level and tending to their own well-being. Up to 64% of women said they have no choice taking up care work, since there is “no other member to carry out the domestic duties”, the 68th round of the NSSO survey found. Bhoir’s experiences reveal how the burden of unpaid work impacts women’s health – domestic chores are often prioritised above personal wellbeing. Cash benefit transfers under the Pradhan Mantri Matritva Vandana Yojana (Maternity Benefit Programme, formerly the Indira Gandhi Matritva Sahyog Yojana), for example, have not meant more rest for pregnant women because they were found doing agricultural work until the time of delivery. Women also spend eight hours less on activities such as learning, social and cultural activities according to a pilot time-use survey conducted by the Ministry of Statistics and Programme Implementation between 1988 and 1999. This meant that the burden of unpaid work not only impacts a woman’s family and community relations but also her ability to play an effective role outside home, in turn perpetuating the gender skew. The immense burden of unpaid work that will remain at the end of a working day is another “major deterrent” for women to participate in, or rejoin the workforce, says the Oxfam report – and is one that is increasing. The proportion of women aged over 15 and in rural areas who spend the majority of their time in domestic duties has increased from 51% in 2004-’05 to 60% in 2011-’12, the year the last NSSO employment survey was released. This lack of public-sector provisions – such as basic infrastructure, elderly care homes and childcare facilities – and affordable private-sector services, means that women are being increasingly left to shoulder the care and domestic work burden, forcing them out of the workforce. This can create a vicious cycle of disempowerment, said Ghosh. The average family size in India is shrinking, the report states – in 2001, each family on average had 4.67 members, down to 4.45 in 2011. In rural India, the proportion of nuclear families, where each sibling sets up a household of their own has increased. In 2001, 83.9% of families were nuclear, which rose to 84.5% in 2011. The wage penalty is so evident in India that “we are at the point where even the government and the public sector don’t pay women properly”, Ghosh said. She cited the example of Anganwadi and ASHA workers, professions dominated by women, that do not even command minimum wage. Instead, these government workers, who form the backbone of the public health system, are paid Rs 2,250-Rs 4,400 depending on their role and miss out on pension, maternity, holiday and other benefits. 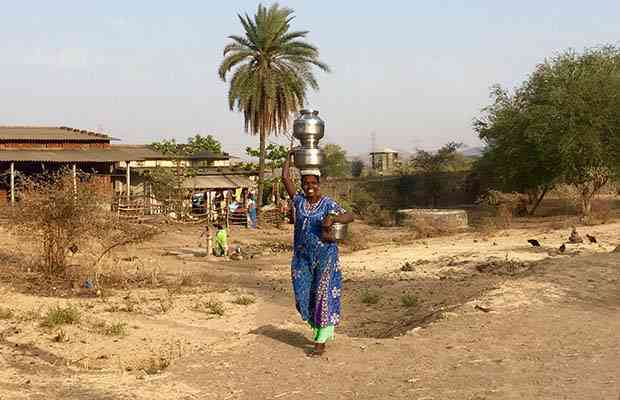 In households with access to the government’s National Rural Drinking Water Programme, women spent on average 22 minutes less per day on care work and 60 minutes per day more on paid work, the Oxfam report finds. The results for households that had begun using LPG gas cylinders for cooking under the Pradhan Mantri Ujjwala Yojana programme were similar – 49 minutes less spent on care work and an hour more on paid work. For example, despite spending 90% of available funds, just 18% of the rural population was connected to piped water supply between 2012 and 2017, against a target of 35%. Poor execution of projects left them “incomplete, abandoned or non-operational”, a key failure of the National Rural Drinking Water Programme scheme, as per this 2018 report from the Comptroller and Auditor General, the government’s auditor. Expensive cylinder refill costs are affecting Pradhan Mantri Ujjwala Yojana, a scheme that Ghosh believes was “potentially very effective”. Up to 40% of households in Chattisgarh had never refilled their cylinder, followed by 17% in Madhya Pradesh, citing costs, according to a 2018 study by MicroSave, a consulting firm. Policymakers have so far failed to address how households will overcome the affordability barrier, with refills priced anywhere between Rs 700 and Rs 800, a significant portion of a poor household’s income. Prices can also fluctuate according to international fuel markets, meaning planning for this expenditure can be difficult. Up to 48% of women currently stop working within four months after returning from maternity leave, while up to 50% more men are working between the ages of 15-24 and 25-34, the child-rearing period, found a study by Intellecap, an investor in social enterprises. Greater attention paid to childcare and maternity leave policies could help restrict the effects of a “motherhood penalty” which entails women dropping out of work, worrying about being absent from work for a long time and accepting less-satisfactory employment, as IndiaSpend reported in August 2018. Workers under the Mahatma Gandhi National Rural Employment Guarantee Scheme are entitled to free onsite childcare provided by their employers, but in reality this is not enforced and many go without. Severe funding cuts to the centrally sponsored National Crèche Scheme meant that 8,143 crèches closed between 2013-’14 and 2016-’17, hitting those with no way of affording private alternatives the hardest, IndiaSpend reported in January.